After 30 years of providing transit service at Arborland, the Ann Arbor Transportation Authority (AATA) has received notification terminating the agreement which provided for a bus stop and transfer location in the shopping center, effective July 1. Over the past year, AATA has worked with Finsilver Friedman Management Corporation of Farmington Hills to successfully resolve the only issue that has been raised, that of bus riders parking close to store entrances. AATA agreed to post signs designating commuter parking areas and to provide on-site staff to monitor the area at critical times. In the short term, AATA plans to locate bus stops near the intersection of Washtenaw Avenue and Pittsfield Boulevard, where there are traffic signals and crosswalks. AATA sees this approach as the best available option for now. AATA’s proposal includes a two-phase increase to change the current fixed-route adult full fare of $1.00 to $1.25 in May, 2009 and to $1.50 in May, 2010. Current half-fare charges would go from 50 cents to 60 and 75 cents, respectively. A dedicated bus rider and WCC student recently sent me an email she received from Washtenaw Community College announcing a new discounted bus pass for WCC students available starting in January, 2009. Avoid parking hassles, save money, and help the environment. Buy a special WCC Pass for students created by the College and the Ann Arbor Transportation Authority. The pass costs $10 and lasts all of Winter Semester— from Jan. 2 to May 4, 2009. With it, you can ride a bus anywhere, any time. To qualify for a pass, you must be taking at least three credits in the Winter 2009 semester. You can buy a pass starting Dec. 15 at the Cashier’s Office, which is on the second floor of the Student Center Building. You’ll need your WCC ID number (the number that begins with the @ sign). To ride the bus, you must show the pass and your WCC photo ID. If you don’t have a WCC photo ID, you can get one at Campus Safety and Security on the second floor of the Student Center Building. Take your WCC ID number and a photo ID, such as a driver’s license. The AATA and WCC have been working on a deal like this for some time. There has even been discussion of creating an express bus route to WCC Given that a 30 day AATA bus pass costs $37.50, this is truly a great deal for WCC students. According to studies by the Institute for Transportation Engineers and others, transit subsidies can reduce the number of people driving alone by anywhere between 1% to 20% depending on other factors. AATA: 7 new locations with bus shelters; where do you want one? “AATA has a long-established service standard of placing shelters at bus stops with 50 or more boardings per day,” says Manager of Service Development Chris White. Last week, AATA published its 2007 Annual Report (12 page pdf), showing continued ridership growth (though less dramatic than in the 2 years previous). Today, the Ann Arbor News and Detroit News are reporting Amtrak ridership increases for the past year. AATA boasted only a 2.5% increase in fixed-route riders in 2007, but notes that the past 3 years have seen a total 30% increase in ridership, as well as a 30% increase in productivity (measured in riders per service hour). Both operators note that system capacity is limited for future ridership increases – AATA notes that additional buses have been added during peak hours to handle the standing-room crowds that riders are familiar with, while the Amtrak articles repeat the earlier warning about a lack of rolling stock for increasing service. The DetNews cites Amtrak officials as estimating that ridership would have increased further, except that weekend trains are sold out, with some weekend demand spilling over onto Monday and Thursday routes. While the A2News notes that Congress has passed a “veto-proof” funding increase of 33% for Amtrak’s upcoming fiscal year, adding and upgrading rolling stock and rails could consume billions of dollars. Ed notes that they’ve also done Detroit, and points out that there are now a couple ways to get between Ann Arbor and Detroit on transit. Google maps doesn’t seem to know about them, though. There were two articles about AATA in the Ann Arbor News today. Article 1: Board member: AATA needs a ‘diet’. AATA Board Member Ted Annis presents a Treasurer’s Report at the AATA Board Meeting. The report criticizes AATA for it’s service, funding, and more. Article 2: Bus from Chelsea to start May 15. An Indian Trails Commuter Bus from Chelsea to Ann Arbor will start on May 15 (during Curb Your Car Month). Initially, the bus will run two times in the morning and two times in the afternoon. Preliminary price for a monthly pass is set at $125. In other commuting news, Ann Arbor is now the proud owner of a Conference Bike. And a place to purchase one. Route 4: Buses from UM Medical Center from Arborland would operate all year round and would add another bus to this service. Route 4: Buses from Ypsilanti to Ann Arbor wouldn’t pull into Manchester. Route 7: A 10:45pm trip from the downtown to the Pioneer High Park and Ride would be added to this route. Route 12UL: This route would be eliminated and replaced with more frequent service on the #8. Route 8: Frequency would increase to every 15 minutes. 12UM: Increase service to Miller Road Park and Ride Lot and service to Skyline High. 1) By computer: Comment or ask questions by email to aatainfo@theride.org (put “Service Changes” in subject line). 2) By phone: Call the service change hotline at 734.677.3934. 3) By fax: To 734.973.6338 (put “Service Changes” in subject line). 4) By mail: AATA Service Changes, 2700 S. Industrial Hwy., Ann Arbor, MI 48104. AATA staff will be in attendance to answer questions and discuss the proposed changes. Reasonable accommodation to permit persons with disabilities to participate will be made if requested at least two days in advance. The Public Info meetings are listed in the link above and start on March 25th. Anyone using Ann Arbor Transportation Authority services today (Friday, February 1) can expect delays due to the current snow storm. For the latest information, call 734.996.0400, go to AATA’s real time information or the AATA web site at www.theride.org. Update: After posting this article I received some feedback from the AATA clarifying some of the statements I made below. I am including their comments in italics so you can get the full story of what is going on. The AATA Board Finance Committee recently asked staff to come up with recommendations for reducing bus service to low-performing routes and increasing service to routes that are doing well. Sounds easy, right? So several months ago, the staff set out to do just that. They based their reduction recommendations on which routes had the lowest ridership (such as the 14 and the 1U) and on consultant recommendations. At today’s Policy and Operations Meeting, AATA Board members were supposed to approve the proposed service changes. The P & O Committee was planning to recommend to the full board that the public input process move forward with respect to the recommended service changes. They were not supposed to approve the proposed service changes. But something amazing happened. More riders are riding buses that ever before. And the low performing routes are no longer doing all that bad. In fact they’re doing quite good. What we don’t know is whether the increase in ridership is along the portions of the routes that are proposed for adjustments. Staff is seeing an unprecedented amount of passengers. 2-3 years ago, there were about 20 passengers per service hour. Now there are 32. October-December of 2006 1,414,976 people rode AATA buses. This past October-December, 1,502,863 people rode. That’s over 85,000 more riders (more passenger trips, not riders) , which is more than twice the enrollment at the U of M.
So who are these riders? Well, the UM does account for a lot of the increase. But that’s not all. The numbers of other riders are up, including those that use go!passes (yeah!). The AATA is trying to figure out how it will modify service to meet the financial needs of the organization and the increased rider numbers. Stay tuned for some public meetings to address potential changes. In the meantime, I’ll see you on the bus! In other AATA news . . . 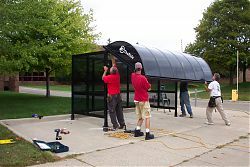 The AATA recently installed 16 new bus shelters. 10 of those replaced old and unhappy shelters. The AATA is looking at the feasibility of a fare increase. The last time they increased the fares was in 2001. But nothing is set in stone and the conversation is just getting started. The frequency of a fare increase is not the main reason to consider a new fare increase. There are many variables including the increase in fuel from 88 cents per gallon at the time we had our last fare increase to now paying $3.00 per gallon. The Policy and Operations Committee is discussing the advertising that is wrapped on the buses. Some individuals with visual impairments are saying they can’t see through the wraps. Since the bus wraps bring in about $169,000 a year to the AATA, the organization is going to have to decide if having the wraps is worth the money or if they just present too much of a hassle for riders. Any comments you have about this would be appreciated. The $169,000 is equal to providing service more than doubling the service on some routes. Finally, the AATA discussed what to do about snow at bus stops. This was recently an issue with the last snow storm since the City plows often pile up snow at AATA stops. The AATA is going to try to work with the City to coordinate snow removal to make sure stops don’t get covered.